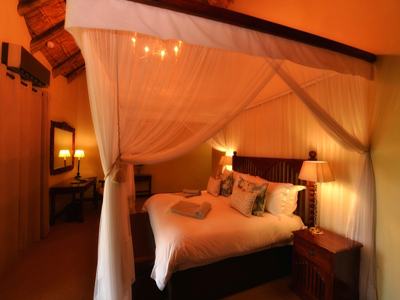 A Luxury boutique hotel within walking distance of Victoria Falls. 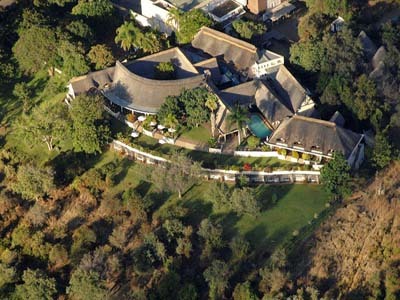 The Ilala Lodge is an intimate boutique hotel very close to the Victoria Falls in Zimbabwe. In fact, the Lodge is so close to the Falls, that you will feel the spray of the Falls on your face if you take a walk in the gardens of the Ilala Lodge. As befits a boutique hotel, the décor is classic, understated and evokes an era of discovery and adventure. 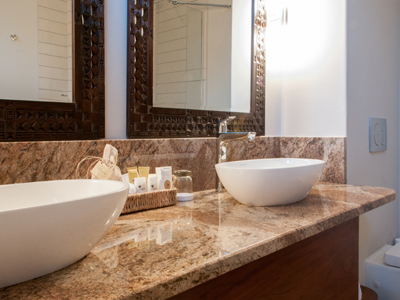 The lodge offers 32 Standard Rooms, 2 Standard Suite Rooms, 20 Deluxe Rooms, 2 Executive Suites, all with en-suites. Furniture is made from teak railway sleepers. Each room has patio doors opening on to the lawn or a balcony. Each room is en suite, air-conditioned and equipped with satellite TV, overhead fan, hair dryer, a digital safe, as well as tea/coffee-making facilities. At your arrival at the Illala Lodge boutique hotel, a fruit bowl and personalised welcome letter awaits you. Other facilities include room service, laundry as well as baby-sitting. 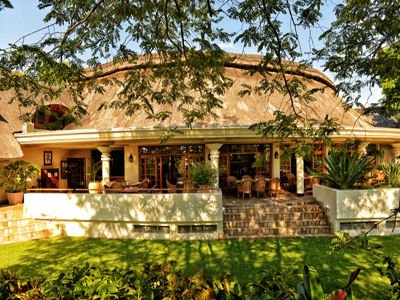 The Ilala Lodge at Victoria Falls has one restaurant the classic Palm Restaurant (serving an a la carte menu, including a variety of game meats). The pool bar serves ice-cold drinks and a variety of cocktails. 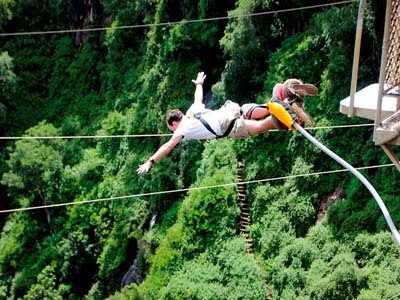 If you are an adrenalin junkie, Victoria Falls is your hinterland. 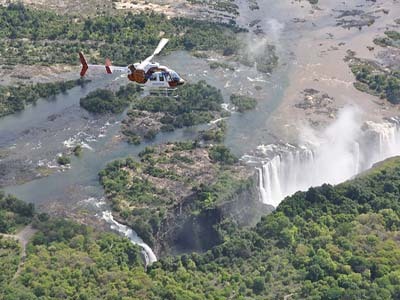 Here you will be able to take part in a vast variety of action-packed adventures, from are light aircraft flips across the Falls, white river rafting and kayaking on the Zambezi River, bungi jumping from the Victoria Falls bridge (for the daredevils), an elephant ride, or a swim in the ‘Devil’s Pool’ (a small rock pool right on the ‘lip’ of the Victoria Falls). If you survive this swim without losing your sanity, you truly have the heart of an African lion! Ilala Lodge has a sister lodge namely Victoria Falls Rest Camp. They offers comfortable self-catering ( self contained ) accommodation and pre-erected tents within in walking distance from Victoria Falls in Zimbabwe. From Victoria Falls it will take you about 8 hours to drive to kariba where Ilala Lodge recommends the Caribbea Bay Hotel and resort. This is the most luxurious hotel in Kariba on the riviera of Southern Africa. If you decided to drive south Ilala Lodge recommends the Lodge at the Ancient City inear the Great Zimbabwe Monument from where see the Zimbabwe Ruins. From Ilala Lodge you can travel west to the Botswana border and then further to the Namibian border and the Caprivi strip. if you are on a family holiday spent a few nights at Ngepi camp on the banks of the Kavango or Okavango River. Your next stop wwill most likely be Etosha National Park where you can choose between accommodation such as hotels, self-catering, lodges and traditional rest camps. From there you can continye west to Damarland where Ugab Terrace Lodge with its breathtaking views over the Vingeklip rock will be you next destination. If rooms are not available at Ugab try Vingerklip Lodge it is of the same standard as Ugab Terrace Lodge. In sharp contrace with the abundance of water at Victoria Falls is Sossusvlei in the Namib Desert. Here is no water by some of the worlds highest sandunes. Sossusvlei Desert Camp at Sessriem at the entrance to the Sossusvlei park. Desert Camp offers luxury self-catering ( self contained ) accommodation. Ilala Lodge strongly recommends the Canon Lodge near the Fishriver Canyon in the south of Namibia. This lodge offers unique luxury accommodation in caves style room. In South Africa accommodation is freely availble. some of these lodges is nt nearly of the same standard as Ilala Lodge. Hanover Inn for example is very basic but they supplty a clean bed for an overnight stop, In contrast is Kob Inn a beautiful resort along the Wildcoast of the former Transkei while Sunriver Lodge in Upington is a luxury guesthouse on the banks of the Orange River. Victoria Falls Rest Camp Lodge at the Ancient City Ugab Terrace Lodge Transkaroo Lodge.